During all of the excitement of the Ohio Valley Conference tournament March 6-9, Belmont Bruins still found time to serve the community. The Bruin Blast Pep Band, busy playing at the men’s and women’s basketball games, had some down time before the championship game at the tournament. Seeing an opportunity to serve the community of Evansville, Indiana, Dr. Barry Kraus, associate professor in the School of Music, reached out to see if student band members were interested. 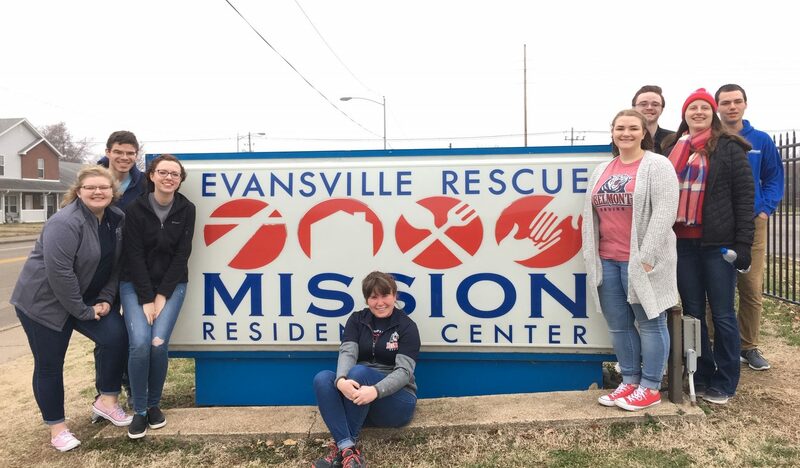 A group of Belmont students rose early to serve at the Evansville Rescue Mission Saturday before the game. The group was split up with some students serving cereal and pastries and other polishing kitchen appliances and mopping floors. The work the students did was appreciated, and guests were happy to talk with students and thank them for their service.